I confess, I’ve never seen Star Wars, or Star Trek. The only video games I play are the Lego ones. And so I’ve been seeing people in these amazing costumes, and going to talks where there are these gaming cultural references that I don’t get, and thinking… woah, I’m not geeky enough. It’s a little amazing how one can do that, right? I mean, in the real world, telling people I’m a software engineer will often stop a conversation. Looking at other people, it’s easy to say, oh that person is dressed better than I am. That person is smarter than I am. That person is, frankly, just doing better at life than I am. Looking at ourselves, it’s hard to see what we’re doing well. 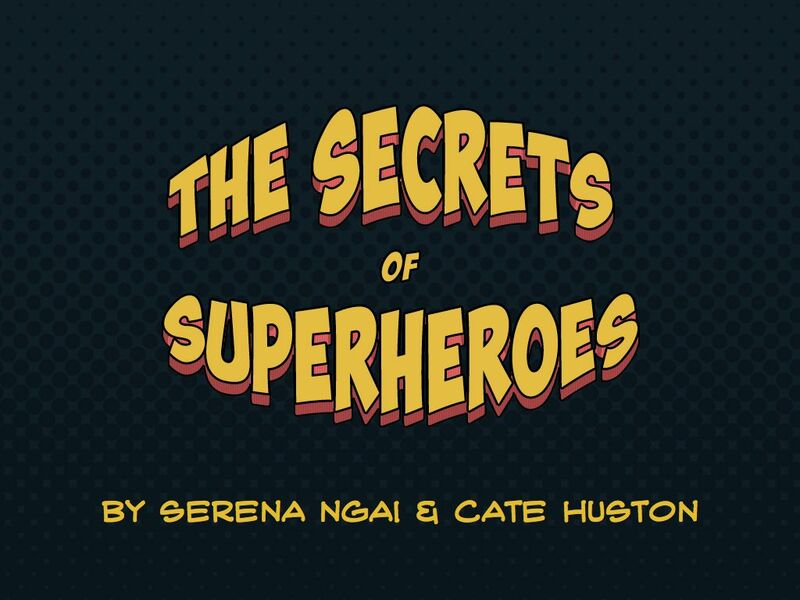 Today, we’re going to talk about the flipside of being a superhero – the side you don’t see, that it’s easy to assume doesn’t exist. We’re going to talk about what a superhero is, anyway. And what we want you to walk away with, is the realization that you are already a superhero. 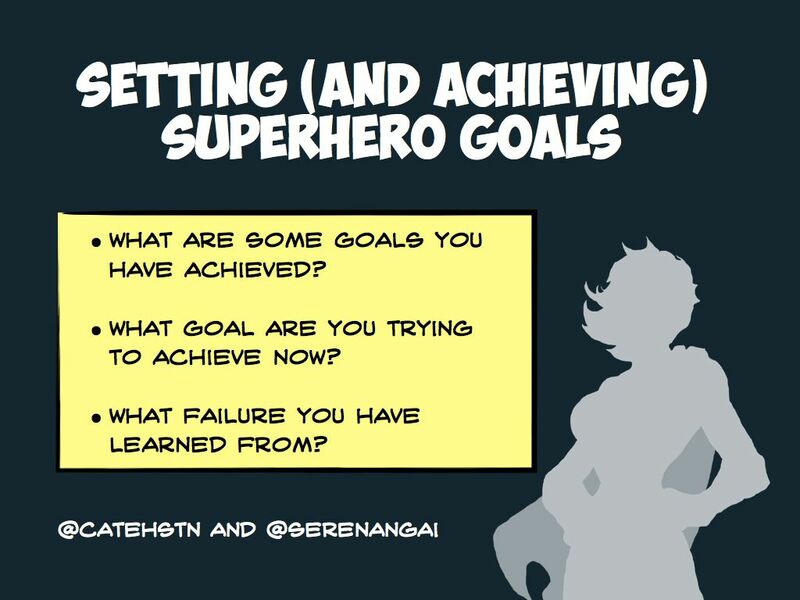 We’re going to share some strategies that we use to get things done, and some stories of our own failures, and the successes we’ve built on them. 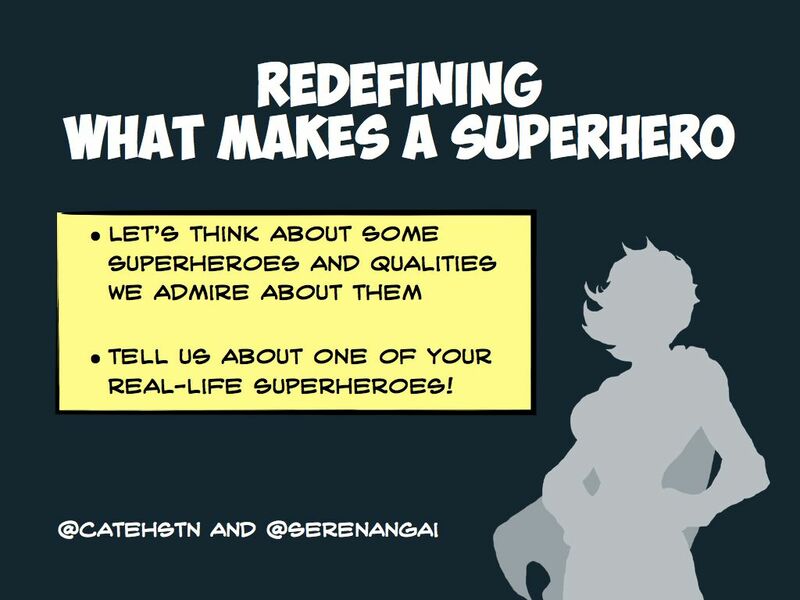 Discussion point: Let’s think about some superheros and qualities we admire about them. It’s great that we have Fantasy superheros – the Wonder Woman video yesterday was amazing. But, what about real-life superheros? Who do you know that inspires you? Discussion point: Tell us about one of your real-life superheros. It’s easy to admire people we don’t really know. We see their successes, but usually we don’t see their struggles. Discussion point: Talk about Big Hairy Audacious Goals you’ve achieved? Cate: getting a job as a software engineer at Google. I studied really hard, practising coding without an IDE, reading algorithm books. So that when I went to interview, I felt as prepared as I could. Cate: getting my level 2 ski instructor qualification. Went out with less experience than a lot of people on the course, but I got up early to ski before class, took as short a break as I could for lunch to ski more, and often closed the hill with the ski patrol in the evening – or went to the gym. Serena: noticing an issue with internal communications within this fast growing company, I took the initiative to approach my managers with the issue and introduce a solution. Took the existing Unicorn accomplishment tool (which was basically one lonely text field) and turned it into a full blown project tracking and achievement tool, to improve communication company-wide. Was featured in Fast Company Magazine this past summer. If a goal is a really enormous, it becomes “safe” to fail at. If your goal is to be Oprah, well, every other person on the planet isn’t Oprah. If you don’t manage it, who’s to judge? It’s an intimidating place to aim for, and how the hell do you start? It’s important to set goals that stretch you, but make sure they are realistic. It’s easier to achieve a bigger goal if you break it down into sizable chunks. 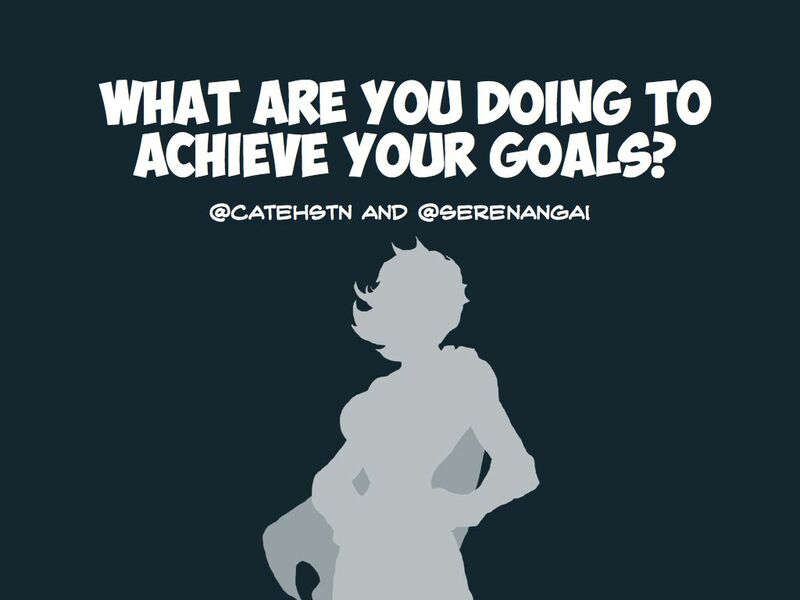 Discussion point: What’s one of your goals right now and what steps are you taking to achieve it? Cate: have a team of my own. I’m starting a new part of the project I work on and I got an intern for the winter. So I want to turn this into something other people can – and want to – work on. Serena: Empowerment through education and creating more positive female role models are two things I’m really passionate about. I founded a chapter of GDI in my community to teach more women how to code and to get more women involved in the local technical community. Everyone knows about the low number of women in tech, but instead of complaining about the issues, I want to see more being done. We had our first event last month, and had the room packed with people. There’s a great book by Richard Wiseman called “the Luck Factor”. It’s all about studies that have shown that lucky people do things differently to unlucky people. They are more open to new experiences, notice things that “unlucky” people don’t, and they take a more constructive approach to set-backs. Failing is the ultimate learning opportunity. Discussion point: What’s a failure that you learned from? Cate: I had an idea for something that I wanted to build, so I prototyped it and took it to people who could make that happen. It didn’t go the way I wanted, but as a result of the experience I really knew what kind of thing I wanted to work on and what kind of environment I wanted to be in. And so I moved to a new project where I get those things. Cate: When I was working at a summer camp, I got passed over for promotion in favor for this guy, who was a complete idiot and had a drinking problem. More than once, he just didn’t show up in the morning because he was passed out from the night before or just hadn’t made it back. So I did his job – and mine – and I thought that would make my manager realize her mistake. It didn’t. He got that job again the following summer, and I learned that it was time I gave myself permission to be a leader – if that was what I wanted. And that he was capable of doing that job, he’d just elected to be drunk instead when I was around to do it for him! Serena: When I was in University, studying for CS I always thought that getting a job at a big tech corporation was the ultimate dream job. One semester I interviewed for Microsoft, I got through the first round, and they wanted to fly me down to Seattle. I spent 2 weeks preparing and studying. I went through 5 interviews that day, and was completely exhausted after. A few weeks later I got a phone call from them saying I got the job – yay! I should be excited right? But I wasn’t. I realized that this position wasn’t right for me, and it wasn’t the direction I wanted to steer my career to. Serena: After 4.5 years of studying CS, I had finally graduated and was looking for full time work. I remember updating my resume one afternoon, and realizing “Wow, I really can’t picture myself being a software developer for the rest of my life and being happy.” I realized that software development wasn’t for me and I felt like a failure because I had just spent years and thousands of dollars studying for a degree for a job I didn’t want. Do you “nudge” or do you “leap”? Your comfort zone is like, a space and as you leave it, it gets bigger. 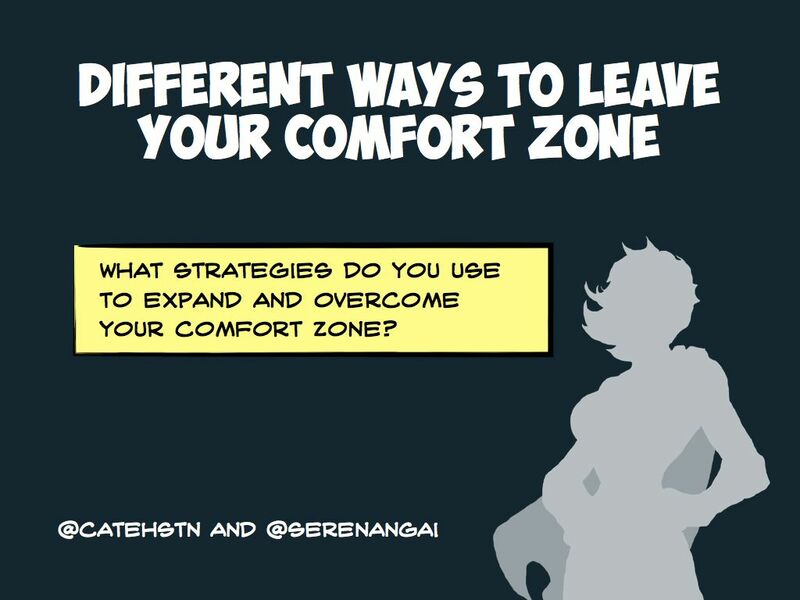 We both use two main strategies for expanding our comfort zones. Serena: Nudging. Continually pushes the boundaries of your comfort zone and so it gradually gets bigger. Taking organized steps forward, to move towards a bigger goal. Cate: Leaping. A couple of times a year I arrange something, or agree to something, that flings me right out of my comfort zone. And then I figure it out and make it work. For example, I agreed to TA in French. I booked myself into a martial arts academy in China for two months. The downside of this is that at the time I quite frequently feel that I’m having a nervous breakdown, but I always, always know that I’m doing something that will expand my comfort zone. Discussion point: what strategies do you use to expand your comfort zone? If you’re on a team of people, hopefully the people on it will have different strengths and backgrounds. Maybe someone is great at writing database code, another person’s great at UI. Someone might be really good at design. It’s easy to compare yourself to everyone, and say, I’m not as good at databases at Alice, and Bob is really great at UI code, and Charlie is much better at design work. Alice isn’t as good as Bob at UI code, and Charlie isn’t as good as Alice at databases. You will have your own strength that they admire in you – stop finding yourself short compared to everyone else in every way. It’s easy to focus on their strengths, but only see your own weaknesses. It’s okay if you’re not the best in absolutely everything. Nobody is. Cate: one of the things I worry about is that someone else on my team writes more code than me because I’ve been asked to be the glue between two teams, and that means that I spend some of my time on that whilst he can be very focused. But this guy does not communicate that well, at all. I might want his strength – but I definitely don’t want his weaknesses! Serena: After I switched careers into design, and began working full-time as a “designer” I felt insecure about my design skills because I never had the formal education that others did. But I quickly realized that my background in CS and visual arts, is highly valued in this field. 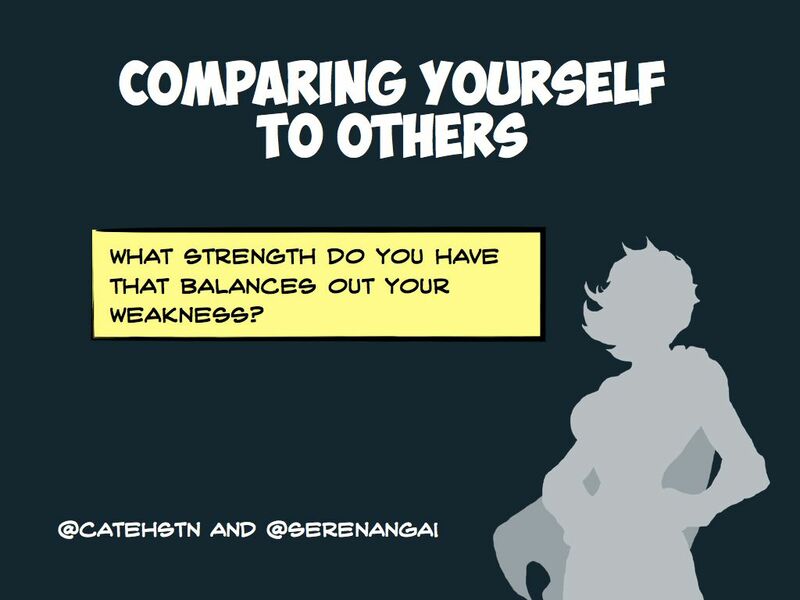 Discussion point: what strength do you have that balances out your weakness? It’s really important to have the right people around you – your real-life superheros are your support team. Your support team provides advice, inspiration (from the cool stuff they are doing), help, and sometimes just someone to listen. There’s very little that you can meaningfully accomplish alone. 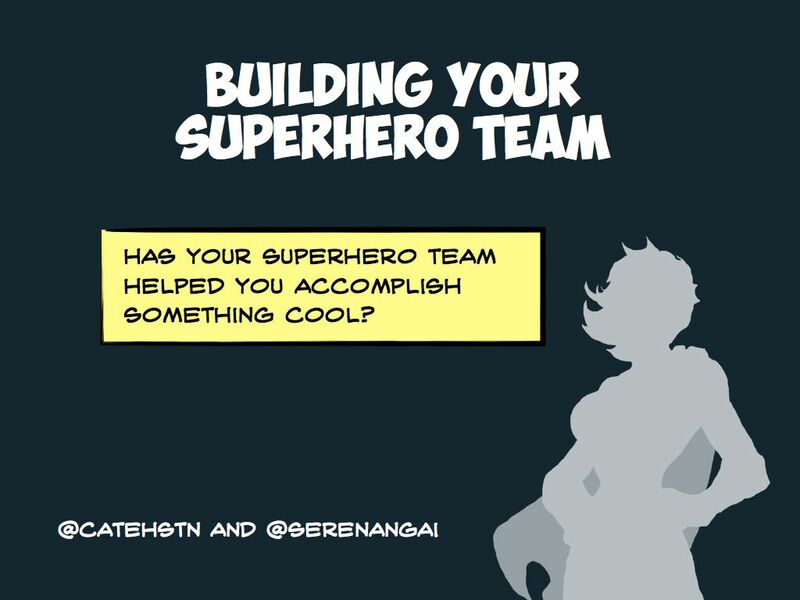 Discussion point: how has your superhero team helped you accomplish something cool? Cate: The Awesome Foundation in KW consists of 14 people. 12 trustees, who provide the $1200 that we give away, and 2 deans. One to run the pitch night events and one for the other stuff. And then 6-8 people who come and pitch. That’s 20 people or more plus the people who come and watch, all to increase the amount of awesome in our community by a couple of projects.